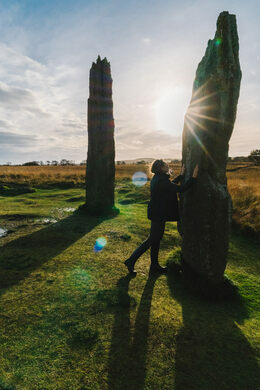 In the age of Outlander, standing stones have a larger fan base than ever before. But what are standing stones? 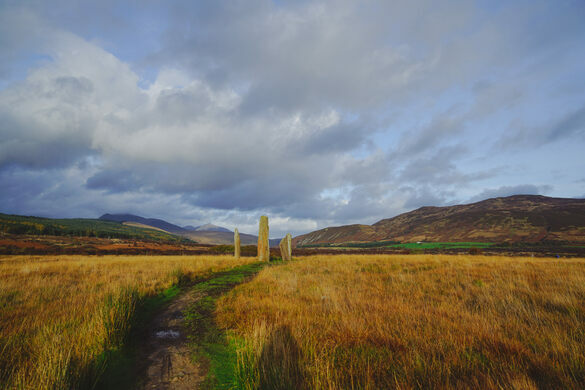 Those at Machrie on Scotland’s Isle of Arran prove it matters little what they are and far more that they have the power to imbue magic and wonder into even the most ordinary of landscapes. 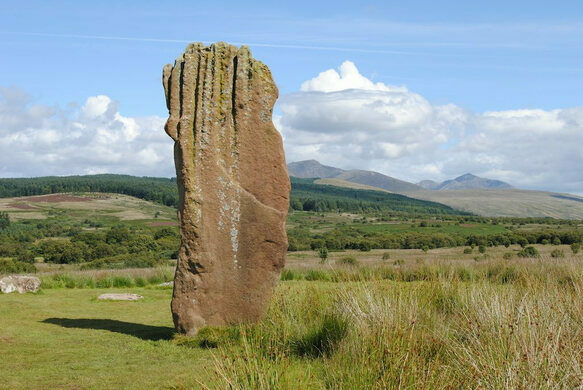 On this picturesque island, the ancient standing stones on Arran have their own special draw. 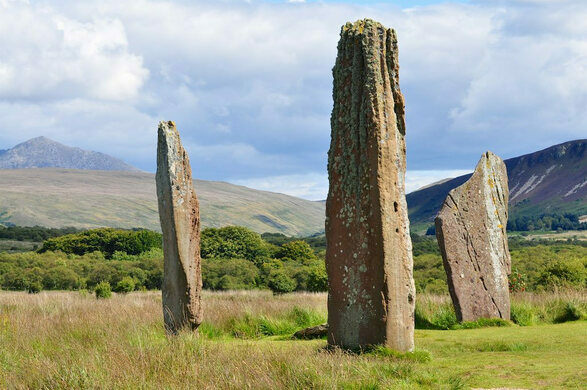 There are no less than six circles at Machrie, built over a period of hundreds of years at least. 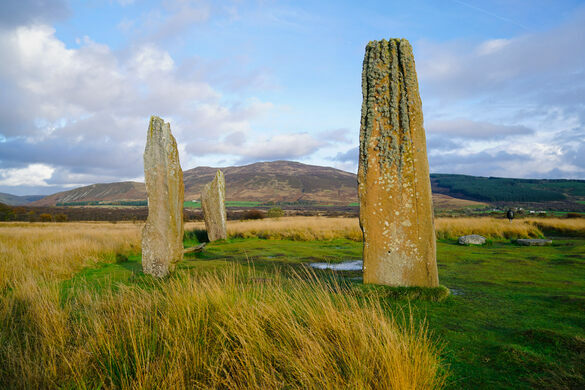 The archeologically inclined will discover stone circles, standing stones, cairns and hut circles; remains of which have been dated to as early as 3500 B.C. Not far from crashing waves but inland enough to be hidden from the major road, the entire site is scattered between crumbling farm houses, twisted trees, and sweeping areas of windswept grasses long enough to conceal anyone who might desire a romp in the heather. Outlander fans would be forgiven for dreaming of just such an activity with any nearby Scot. You won’t find a hill such as the one in the television show, but the same wondrous spirit seems to be waiting as you touch one stone and then another, worn with time and covered in lichen. Golden hour and sunset light only serve to heighten the sense of fantasy. 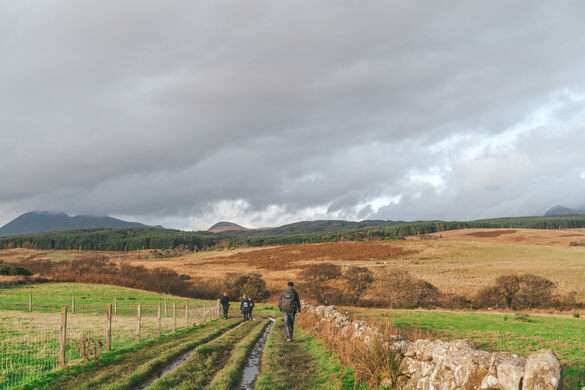 The Isle of Arran itself already has a certain romance to it, known across the country as “Scotland in Miniature” because it has all the elements that make the country great, all heaped together on a pile of rock less than 20 miles long and 10 miles wide. Add frequent rain showers and plentiful rainbows to the mix and it’s simply incredible the island isn’t more popular as a tourist destination. Once you have taken a ferry to the Isle of Arran, take the 324 bus or, if driving, turn right when you get off the ferry and follow the signs for Blackwaterfoot and/or Machrie. 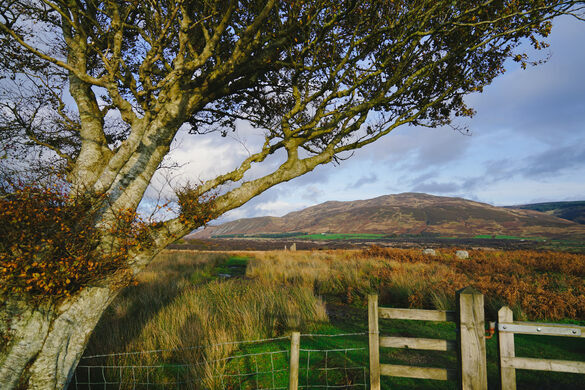 When you're roughly three miles north of the village of Blackwaterfoot, look for a parking lot on a plot of farm land. It's the only parking lot with fencing in that area. There's a path that leads away from the gravel/dirt lot, over fields and toward the stones. 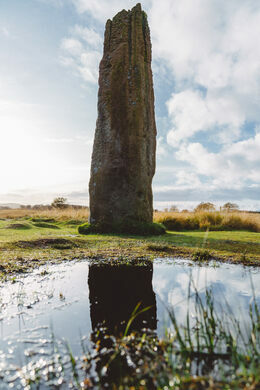 You'll park and, with wellies or some time of waterproof shoes, walk about half a mile from the road to the first set of stones. From there, most of the rest of the stone circles are visible from each new circle. No matter what time of year you visit, waterproof footwear is important. This is uneven ground that sometimes dips below the water table so there's always moisture on the path, sometimes more than just a little. It's not a difficult walk but it does take a while and those nervous about uneven footing should be careful. Originally intended as a temporary installation, this sculpture is now a permanent part of a stunning Scottish beach. The carved medieval stones stand near the ruined abbey's parking lot. A bizarre stone beast lurks on the beach of a popular tourist island. 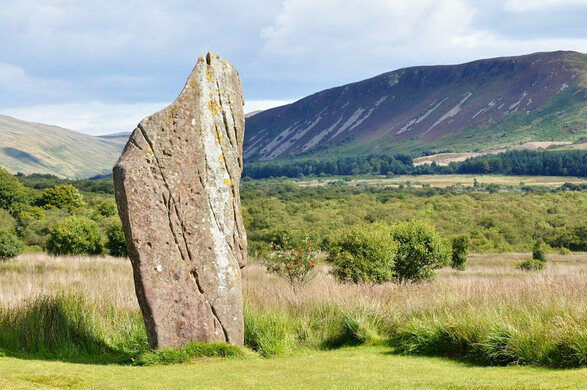 Modern megaliths form this work of cosmic, Celtic landscape art.